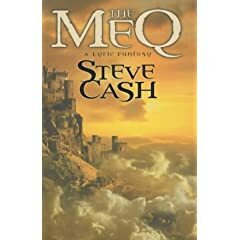 Sold under the label "A lyrical fantasy", The Meq is a story about Z (short for Zianno), who is a meq, a member of an ancient race on earth. The meq are a people of twleve year olds. Or at least, they look twelve, but they live for thousands of years (or until they decide to get married, for some reason, but this is explained in the book). Of course, the quests in the story regards "evil" (or morally challenged) meq, and things relating to the mysterious sailor character Z is told by his dying parents to find. The story is set in late 19th century, and early 20th century, and actually has a nice setting in the american south, where I as a non-history buff can appreciate the transferred feeling for the characters and the environment. The book is character driven rather than plot driven, and if one can forgive cameos by certain famous people, it is well written. Of course Z's 'human' friends get in trouble from the evil meq, but this obvious storyline can be forgiven by the interesting way it is executed. Many things are left open in the end of this book, and before I was going to praise the author for doing this, I did a websearch. It appears it's the first in a trilogy. Am I fooled or what... anyway, it's a pleasant book, and the lyrical part of the advertising was actually not a misleading sales trick. This was posted at wotmania back in 2005, or so. Since then, the second book is out, the Time Dancers. "People think it must be fun to be a super genius, but they don't realize how hard it is to put up with all the idiots in the world" - Calvin.